Bluefire Consulting is looking to offer an exciting opportunity to a graduate calibre candidate within our progressive and highly successful Graduate Trainee program. Bluefire is an established recruitment company seeking an enthusiastic and determined individual to join us in our busy Liverpool City Centre Head Office. Operating on a Nationwide level Bluefire provides recruitment solutions for high profile clients such as Virgin and Wagamama. Bluefire has been operating as a specialist Recruitment and Headhunting agency for fifteen years, boasting highly successful Consultants covering areas including Commercial and Finance, Engineering and Technical, IT and Telecoms and Sales and Marketing. Ranking in the Financial Times 100 fastest growing UK companies, Bluefire maintains a strong primary focus on exceptional service to our extensive contact-base including both candidates and clients. Consequently, the ideal candidate for this graduate scheme will have outstanding sales or commercial experience within a relevant field and if possible, have previously completed a placement year or part-time role. Entrepreneurial tenacity is a must, as Bluefire is a rapidly expanding company which expects the same level of progression from its employees. In return Bluefire will provide full training and a competitive starting salary of £14,000-£17,000 pa plus bonus. 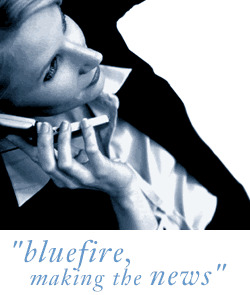 This first stage of the training program will last approximately 3 - 6 months and is designed to allow a full understanding of how Bluefire operates as a business within the Recruitment sector. The nature of these duties requires that the applicant has excellent attention to detail and good time management skills. On completion of this first stage the applicant will then progress to Resourcing level estimated to last 6-9 months with a salary increase to approximately £25,000 pa (inclusive of bonus) in addition to a contracted company IPhone and laptop. On completion of this final stage the opportunity will arise to progress to fully qualified Recruitment Consultant, with benefits of up to 30 days holiday, a car allowance and earnings which can be in excess of £70,000 pa. The ideal candidate for this role will possess excellent communication skills, both written and verbal, with a keen willingness to learn and develop. They will be career focused and excel in a target-based environment.